In Early 2018 we were approached by an inspiring yoga practitioner – called Gavin Cox who had to travel to his classes a lot by bike. Gavin had done a lot of personal and objective research that showed that the range of bags suitable for carrying yoga bags was really limited. He had reached the conclusion that the ideal bag to carry a yoga mat and all the associated kit on a bike would be a compact backpack. Now there are backpacks for Yoga mats on the market but they all seemed to be clumsy or bulky, and almost all of them orientate the mat in a way that either banged the back of your head or made the bag too wide. We researched all the positioning and weight distribution issues and built a through analysis of what to carry and how to carry it. 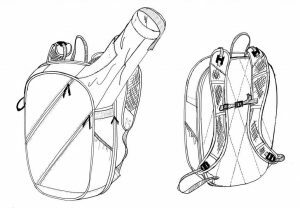 With a full study of the market, a study of the ergonomics and consideration of weather and user needs we then created concepts of designs for several different ways of making a backpack / yoga mat carrier for Gavin to select from. He studied the ideas from the perspective of a regular & demanding user and working together as a team we ended up with a final design that uniquely includes the ability to carry other yoga accesories and even a laptop in a compact backpack. Not only does the final design have the ability to carry a yoga mat – but it is ideal for unpredictable weather (!) 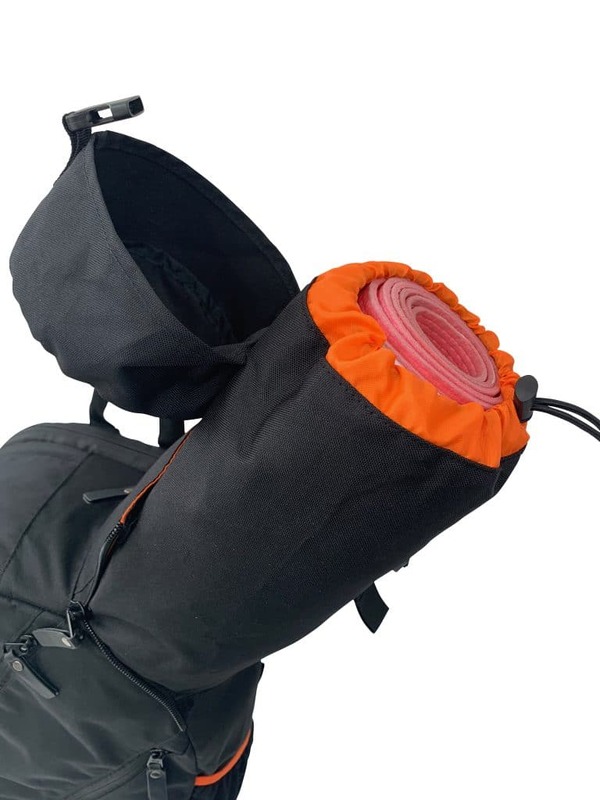 as it can keep the mat dry and it can also be transformed into a standard day pack when you compact the mat tube back inside the rucksack. Here at Design IQ we then arranged to make the samples so the client could test them, in real life day to day conditions. Working together with the client as a team we refined details to make the design just perfect in the process. The sample then went through a series of steps of costing’s and then final sampling and we produced 10 sales samples in time for their Launch Exhibition. The bag has a highly distinctive appearance – some people might find it a bit odd – but it is very distinctive, unique and memorable – which is helpful when building a new brand where Social media will be a key communication tool. The picture above shows how the yoga mat tube folds away inside the bag – but what you can’t see in these pictures is the really clever internal construction of the bag…. (that is mass manufacture friendly!) 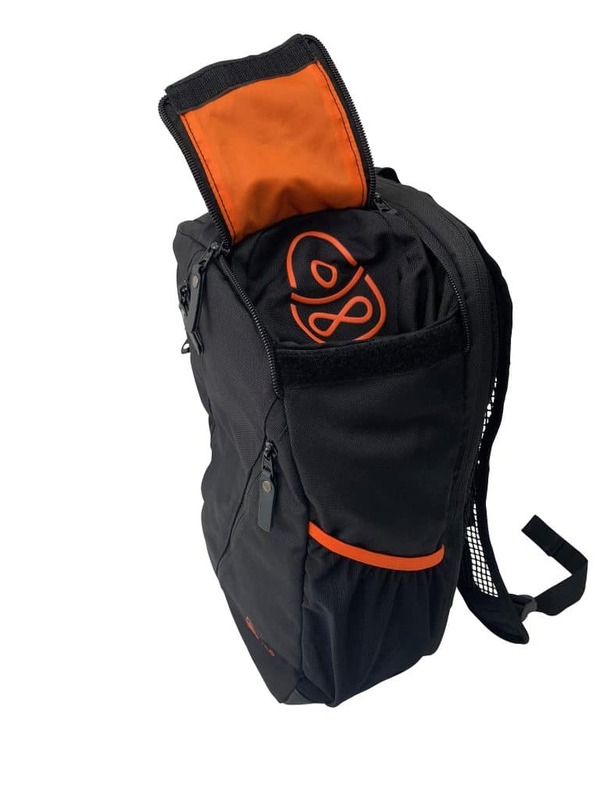 Inside the bag are four separate compartments, with space for EDG ( Every Day Gear) , yoga clothing, towel, and even a laptop and documents. With pockets for phone, keys and water bottles the Yogipac is a thoroughly “thought through” bag. Gavin’s family worked as a team and launched the Yogipac at the Yoga show in late 2018 to acclaim, and designer Guy Mathiot personally attended the launch and assisted with staff training and promotion at the show. Yogipac is a classic example of Design IQ helping a client who has started out with a “market observation” who wants to create a new product to solve problems. Our role was to provide the creative design, and product development step by step to help them along the path from market research to concept to design and finally creating samples – so they can launch their brand. The client paid for our work in step by step stages matched to the process of work ……this is what they said at the end of the project: “Guy has been extremely helpful and knowledgable about our interesting/different backpack product and we would highly recommended him to get a great finished article! We will look to continue to work with Guy and grow the product”. If you think you have a clever idea the market is waiting for – send us an email for a free 20 min consultation now.